Foto Friday CXXV – ..:: NJ Brideau ::.. This is a very timely photo, as the Perseids meteor shower peaked here in the UK only a couple of days ago. You might remember two years ago, when I ventured out to try and capture a meteor in a photograph. This year I went back to pretty much the same spot, except this time I pointed my camera at Perseus (instead of the other direction) and waited for the show. I was West of Oxford looking back East over the city, which means plenty of light pollution, plus some low level clouds, both of which are visible as the bright orange clouds above. I took pictures with several different settings, but I found that mostly what I needed to do was wait for the constellations of interest to move up in the sky and be free of the background light. After continuously snapping every 20 seconds for near an hour I was cold and a little bored. 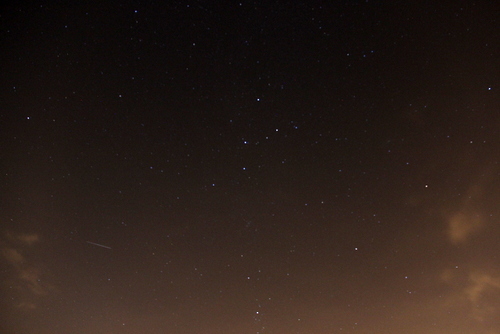 At the peak there are supposed to be 1-2 meteors visible per minute, but I didn’t see nearly that many. I did manage to see the longest and brightest one I’ve ever seen, and I think at least three of them crossed the area that I had my camera pointed toward. The little guy on the lower left is the best of the two that I managed to capture. 15s f/3.5 18mm ISO 800. Contrast adjusted. Au revoir until next week.